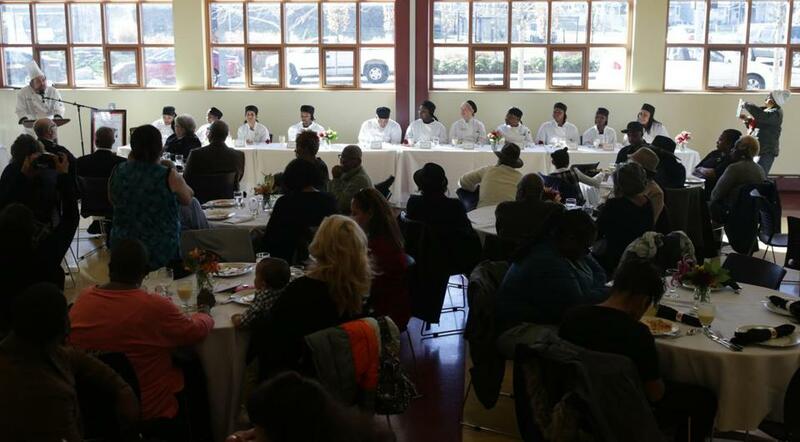 Family, friends, and invited guests enjoyed the Culinary Arts Training Program graduation at the Salvation Army’s Kroc Center in Dorchester. 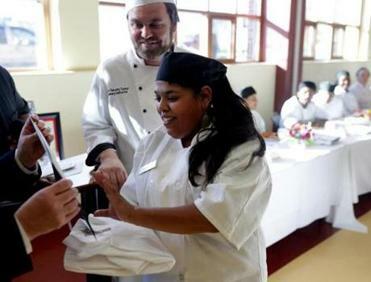 When Ishana Strazzero-Wild recently completed the Salvation Army’s culinary arts training program in Boston, the 34-year-old Dorchester resident left her graduation ceremony in proud possession of several new things. Her very own knife set. A chef’s coat emblazoned with her name. A cooking job at Eataly, the new Mario Batali food emporium at the Prudential Center. And a conviction that her new career path in the food and restaurant sector would be a promising one. That’s certainly true these days in Massachusetts, where a recent business survey found that the state’s dining sector is facing its worst labor shortage in more than three decades. That survey, by the Federal Reserve, called the staffing situation a “crisis,” and Boston-area restaurants of all types report that hiring at every level, from dishwashers to chefs, is a major challenge. But those industry woes pose an opportunity for graduates of free culinary training programs offered by the Salvation Army, Pine Street Inn, Lazarus House Ministries, Community Servings, UTEC, Roca, and other local nonprofits, which have become a small but valuable source of employees for the region’s food service industry. At this month’s culinary graduation at the Salvation Army’s Kroc Corps Community Center in Dorchester, for example, several prospective employers attended the event to canvass for possible hires. Among them was Kari Naegler, executive chef at Wegmans Food Markets, which has four stores in Massachusetts and is poised to open three more, all of which have numerous jobs to fill in their sushi sections, cafes, bakeries, pizza departments, and elsewhere. Also scouting for prospective employees at the graduation was Jason Juliano, who works in human resources at Beth Israel Deaconess Medical Center, which needs workers in its food service department, from cafeteria help to people who assemble patients’ meal trays. “It’s a tight labor market and there’s definitely a shortage of food service workers, particularly the skilled ones like cooks,” said Juliano, who is scheduling interviews with several Salvation Army culinary graduates. Aimed at low-income students, the programs generally offer basic training in cooking techniques, knife skills, food terminology, menu planning, nutrition, and kitchen safety standards. Many also teach “soft skills,” such as resume writing and effective interviewing, and job-readiness, like the importance of punctuality. Some include field trips to restaurants to see professional cooks in action, and the Salvation Army’s “guest chef” program brings in prominent restaurateurs — including Andy Husbands of Tremont 647, Tony Maws of Craigie on Main, and Mark Romano of Highland Kitchen — to teach occasional classes. Most also provide job placement assistance at not only restaurants, but school cafeterias, hospital kitchens, nursing homes, sporting venues, corporate cafes, and large food supply companies such as Aramark and Sodexo. “There are more jobs than we have students for,” said Paul O’Connell, the former chef/co-owner of Chez Henri in Cambridge who is now culinary director at the New England Center for Arts & Technology, which offers a 16-week culinary training course. Graduates of the nonprofit programs have landed jobs at places as varied as Legal Sea Foods, Clover, Bruegger’s Bagels, Starbucks, Sky Chefs, Gillette Stadium, TD Garden, and CommonWealth Kitchen, a culinary incubator in Boston. “We’re a feeder program” to the food service industry, said Chef Timothy Tucker, who created the Salvation Army’s culinary program. And even low-level jobs in the food sector can lead to lasting careers. “The beauty of our industry is if people have a really good attitude and want to learn, they can go from the dish room to the boardroom and everywhere in between,” said Robert Luz, chief executive of the Massachusetts Restaurant Association, which collaborates with many nonprofit programs. Another recent graduate of the Salvation Army’s culinary program is 29-year-old Mattapan resident Tyshawnna Richardson, who will soon begin a job in produce and sales at Eataly and would eventually like to open a café of her own.